Azure Functions applications can leverage the Azure SignalR Service bindings to add real-time capabilities. Client applications use client SDKs available in several languages to connect to Azure SignalR Service and receive real-time messages. This article describes the concepts for developing and configuring an Azure Function app that is integrated with SignalR Service. Azure SignalR Service can be configured in different modes. When used with Azure Functions, the service must be configured in Serverless mode. In the Azure portal, locate the Settings page of your SignalR Service resource. Set the Service mode to Serverless. A client application requires a valid access token to connect to Azure SignalR Service. An access token can be anonymous or authenticated to a given user ID. Serverless SignalR Service applications require an HTTP endpoint named "negotiate" to obtain a token and other connection information, such as the SignalR Service endpoint URL. Use an HTTP triggered Azure Function and the SignalRConnectionInfo input binding to generate the connection information object. The function must have an HTTP route that ends in /negotiate. For more information on how to create the negotiate function, see the SignalRConnectionInfo input binding reference. To learn about how to create an authenticated token, refer to Using App Service Authentication. Use the SignalR output binding to send messages to clients connected to Azure SignalR Service. You can broadcast messages to all clients, or you can send them to a subset of clients that are authenticated with a specific user ID or have been added to a specific group. Users can be added to one or more groups. You can also use the SignalR output binding to add or remove users to/from groups. For more information, see the SignalR output binding reference. SignalR has a concept of "hubs". Each client connection and each message sent from Azure Functions is scoped to a specific hub. You can use hubs as a way to separate your connections and messages into logical namespaces. SignalR client applications can leverage the SignalR client SDK in one of several languages to easily connect to and receive messages from Azure SignalR Service. By convention, the SDK automatically appends /negotiate to the URL and uses it to begin the negotiation. Although the SignalR SDK allows client applications to invoke backend logic in a SignalR hub, this functionality is not yet supported when you use SignalR Service with Azure Functions. Use HTTP requests to invoke Azure Functions. Azure Function apps that integrate with Azure SignalR Service can be deployed like any typical Azure Function app, using techniques such as continuously deployment, zip deployment, and run from package. However, there are a couple of special considerations for apps that use the SignalR Service bindings. If the client runs in a browser, CORS must be enabled. And if the app requires authentication, you can integrate the negotiate endpoint with App Service Authentication. 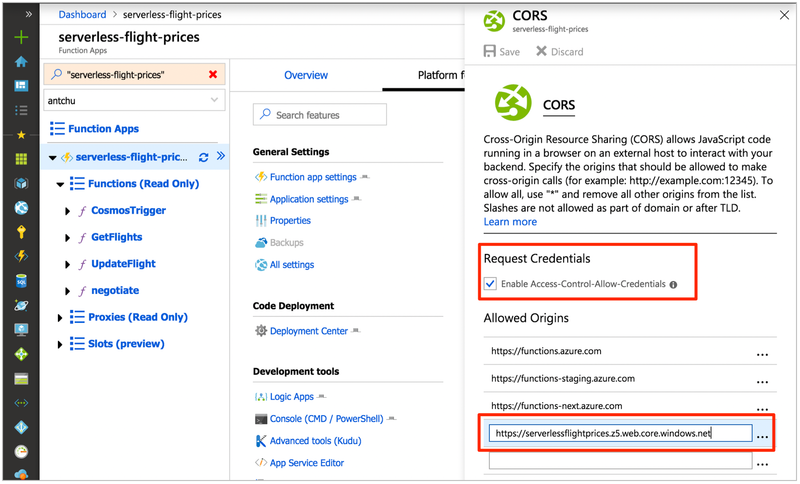 To enable CORS on an Azure Function app, go to the CORS configuration screen under the Platform features tab of your Function app in the Azure portal. CORS with Access-Control-Allow-Credentials must be enabled for the SignalR client to call the negotiate function. Select the checkbox to enable it. In the Allowed origins section, add an entry with the origin base URL of your web application. Azure Functions has built-in authentication, supporting popular providers such as Facebook, Twitter, Microsoft Account, Google, and Azure Active Directory. This feature can be integrated with the SignalRConnectionInfo binding to create connections to Azure SignalR Service that have been authenticated to a user ID. Your application can send messages using the SignalR output binding that are targeted to that user ID. In the Azure portal, in your Function app's Platform features tab, open the Authentication/authorization settings window. Follow the documentation for App Service Authentication to configure authentication using an identity provider of your choice. Once configured, authenticated HTTP requests will include x-ms-client-principal-name and x-ms-client-principal-id headers containing the authenticated identity's username and user ID, respectively. You can use these headers in your SignalRConnectionInfo binding configuration to create authenticated connections. Here is an example C# negotiate function that uses the x-ms-client-principal-id header. You can then send messages to that user by setting the UserId property of a SignalR message. For information on other languages, see the Azure SignalR Service bindings for Azure Functions reference. In this article, you have learned how to develop and configure serverless SignalR Service applications using Azure Functions. Try creating an application yourself using one of the quick starts or tutorials on the SignalR Service overview page.